Sadly enough for those waiting on the Motorola Droid X has to wait a little longer, it seems the shipping date keeps getting longer and longer each time. If you look over on Droid-Life you will see there screen print image showing the Droid X and its new shipping date of 9/8, well if you look below you will see our screen print image that now says 9/9, why the delay? So the DROID X shipping date has been pushed back yet once again, this happened with the HTC Incredible and within time they updated and can now supply via Verizon Wireless. The question now has to be “Will you wait for the Motorola Droid X or go for another smartphone?” Please let us know your choice. Another thought worth thinking about has to be the case of when will the Droid X and the Droid Incredible receive Android 2.2 aka FroYo, at the moment the only Droid models that has it is the original Droid that is no longer available and the Droid 2, we will keep you up-to-date on the above so keep coming back. i ordered my driox x on the 19th of august…the picture that day said it will ship by the 31st…the next day after i looked and my payment was already processed it said 9/6 and everyday since it has gone up..i emailed customer service and one person told me it would still ship on 31st and the other said by the 6th..they honestly dont know..its bs i paid them a week ago, maybe i should put a sticker next to the debit they are taking out and have it say"ill pay ya later dude just give me some time"! ………..ne1 have any insight of when you think ill actaully get my driod x? That's what happened to me as well. However, when I check it order status mine says it will ship by 9/6. Hope I get it by then I am going out of town for the rest of the month! I agree about VZ charging you for something you haven't received yet. I purchased and placed my order at a Verizon location on July 21st – just hung up with them and they still cannot give me a firm date. Very frustrating – but hey, they have my $400. I got the Incredible. I like the phone but it can't do half what my other phone could. I wanted to return it but was talked into keeping it by Verizon support assuring me the group update would fix all that. It's been several months now & no update. Last time I listen to them. I don't recommend the Droid X. I used to have a blackberry storm and the phone used to freeze up and reboot often. It was extremely frustrating if I was using to GPS to navigate somewhere and all of a sudden the phone would turn off then reboot. Well, the Droid X is starting to be like my old storm. I don't like how Verizon is doing business. I got the Droid as soon as it came out, then a few weeks later the Droid X came out. Later my GF joined my plan, so I got the X. I kept wanting to return my phone because of some of the issues like the low sound level, rebooting, sound echo when talking on the phone and the weird motoblur OS. Verizon kept promising to launch Froyo in August then late summer and now early September. Verizon keeps pushing back the update and they hook customers to not return the phones. I've never been so frustrated with Verizon! If you order now (8/25/2010), then the latest shipping date is 9/9/2010 (Remember, that is the LATEST date, the WORST CASE SCENARIO, which is about a potential 2-week wait; not too bad. I ordered my Driod X on 8/2/2010 with the shipping date of almost at end of August, which was a scary, possible 4-week wait. However, I received mine in about a week after. IMHO, if you want the Droid X, order it online, don't be scared by the shipping date. That's a relief to hear. I just ordered mine online and can't wait to get it. You should be able to receive it next week. Keep us posted! I don't understand why people are complaining about getting charged first but with no phone shipped. I received my phone about 2 weeks ago, and I have not paid it yet, haha 😀 I chose the "bill my account" payment option, and all charges were included on my next Verizon bill, which the payment due date is early next month. Just a reminder, make sure you select the free next day shipping (if it is still available; I think you have to enter a code before finalizing your order). I didn't and forgot cos I figured I had to wait couple weeks anyway, one more day was not going to kill me….then in about a week, I got an email saying the phone was shipped…. Wow hope mine comes that fast! Stuck using a dump phone…I know now why they are called smart phones. Ahhh almost been a week. Just ordered droid x today (8/27) was told it would be shipped on 9/10 to arrive 9/11. I had the droid X had to reboot all the time and low volume exchanged it for the incredible I like it a lot more great sound but I am annoyed about the 2.2 update when is it comminng!!!! I lost my storm one so had to get a new phone…so got the storm 2. (Been using Blackberry for 2 years it's o.k. )Thought all the problems were all fixed!!! Wrong! Still froze and took a long time to load pages. Girlfriend got the Incredible(her first smart phone) and loves it. I played with it and it has lots of cool apps we can use together. 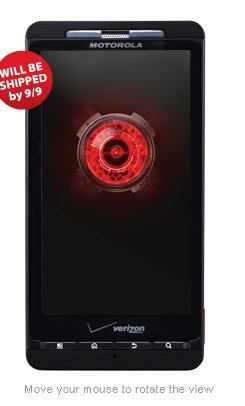 I'm a electronics nerd so Decided on the Droid X…ordered it Monday afternoon(8/23). Let's see how long the wait is…tomorrow it will be day 5. Kinda worried about leaving my Blackberry. My brother ordered his droid x on 8/24 and got it a week later. The dates being posted are guaranteed shipping dates. I talked to numerous verizon reps and they said they were over exaggerating just in case something happened. This often makes customers happy with the surprise of an early ship date too. A week later?!?!?!?!?!!?!? It's 8/28 now, how could he have received it a week later?!?!?!?!? I ordered mine 8/22 and am still waiting, they told me it'd be shipped by 9/7. I'm in the same boat as you…I can't believe someone received theirs a week later and they ordered it the day after me? I am pretty sure this is a "planted" Verizon rep. trying to get people to relax about the delayed shipping dates. Not cool! You can kinda assume its not first come first serve, so dont base your order off someone elses. The orders are most likely shipping out based on the stock of the warehouse that serves your region. I ordered mine on the 08/24 and haven't heard anything (SC). i'm in the same boat…ordered Aug. 23 and still waiting. Called the Verizon rep and all they could tell me was a regurgitation of the Sept. 7 shipment date. Not good. got mine online the 25th they called 2 days later said it will be there the 8th but when i look on the website it says the 13th is the shipping date?????? I ordered 8/19…. still no Droid X… customer service is of no help..
i ordered mine on 8/21 and it had an expected ship date of 9/7. still havent received anything but i hope it comes in the next few days. i placed my order at a verizon store on 8/21. my droid is set to ship by 9/7 and sadly no email yet. i also live in WA. I ordered my Droid X on August 26th. I have been checking my order status daily HOPING that a tracking number will show up…still nothing 🙁 …..My buddy just bought the HTC EVO (sprint) and the demands for that phone is just as high as the Droid X. He received his phone just 6 days after ordering it! I guess it's just kind of a shot in the dark…. Ordered mine on the 23rd and got it 2 days ago… it's sooo cool! No email… just arrived. Was supposed to be shipped on 9/7…. Ordered the Droid X on 8/24 and it's going to be delivered tomorrow. They keep the dates pushed back just in case they can't get them out, but in all reality they're having no problems getting the phones out as quick as possible. My brother ordered a Droid X towards the beginning of August and he got it in 7 days from the date of ordering. dude i ordered 8/3 and still nothing!!! gettin psssssssssd!!! wow dude that is way to long i ordered on 8/24 and received in on 9/3 it shipped on 9/1!!!! CALL them demand your phone bro!!! Just ordered mine 9/3 and order status says it will ship no later than 9/20. Not a bad wait for a great phone. I'm in Northern California. I agree with the issue about the region's warehouse stock. The online date is an estimate, obviously allowing about an extra week for delays in receiving their shipments, staff illnesses, etc. I'm expecting to receive it within 2 weeks. I can't wait! Ordered mine on 8/25. Just got a shipping email today 9/5. It was supposed to ship 9/9. Of course there is no fedex info on there site yet, assuming that is due to the holiday. I ordered mine almost a month ago. Went to my brothers graduation of the USMC in San Diego CA. Came home and nope not in yet. My brother told me to have patience. God bless you all and to the USMC. My order was supposed to ship out on the 16th but I'm getting the phone today! It's just an estimated time they would like to have your phone out, but most likely you could be getting yours sooner than you think. I ordered my Droid X on August 26th. I have been checking the order status on verizons website and it still says "Due to overwhelming demands, your DROID X by Motorola will ship on 9/10/2010". I've called Customer Service a couple of times just making sure my order wasn't canceled or anything. They keep telling me everything is good to go, so….I guess i'll continue to wait. When I purchased my Storm2 it was the same situation. It was hard to get when it first came out. I ordered online (same as Droid X) and received it about a week later! Does anyone know what happens if you go past your expected ship date?